Vivid and visually appealing, our window displays are great at attracting the attention of the many hundreds of people who walk by your shop or business every single day. Easy to apply and remove, these shop window decals can be placed on both sides of the window, drawing potential customers in, boosting your brand identity and promoting the message that you want to convey. We can offer UV resistant vinyl window graphics which are great for long-term advertising. 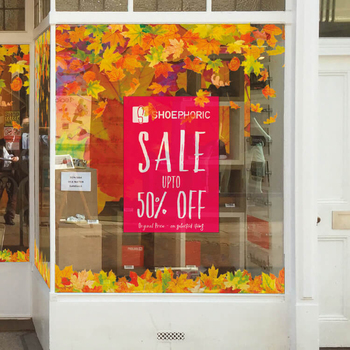 Or for more seasonal marketing, why not just peel the vinyl off at the end of a campaign, and replace it with your latest message, keeping your promotions current, and your shopfront fresh. A great alternative to signs or banners, why would you not take advantage of what is, quite literally, right in front of you. If you’re looking for window graphics call us now and we'll be delighted to help.